Spreading wings: A Bombardier Learjet 45. The company has named Mumbai-based Air Works India Engineering Pvt. Ltd as the first Bombardier line maintenance facility on the Indian subcontinent. Mumbai: With Indian business conglomerates and real estate companies increasingly buying more small luxury planes for private and business use, manufacturers of such planes are planning to offer broader range of after-sales services by tying up with domestic aircraft repair firms. Following the footprints of manufacturers of big aircraft such as Airbus SAS of Toulouse and Boeing Co. of the US, small plane makers are offering complete repair services and planning to source components from India. 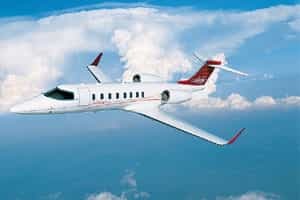 Leading business jet makers are Bombardier Inc., Gulfstream Aerospace Corp., Dassault Falcon Jet Corp. and Cessna Aircraft Co. Airbus and Boeing also sell corporate jets in a smaller way. During the Dubai Air Show this month, in a largest business jet fleet order in India to date, Brazilian plane maker Embraer SA and upcoming charter plane operator, India’s Invision Projects Pvt. Ltd have signed a contract for 20 Phenom type of executive jets. Apart from commercial passenger planes, Embraer also makes small jets. In a statement, Vinit Phatak managing director of Invision, said Embraer was willing to take the special steps required to cater to the Indian subcontinent, an area considered soon to be one of the largest markets in the world. The price of a small luxury jet plane starts from $10 million (Rs39.7 crore) to up to $60 ­million. Indian business houses also tend to opt for helicopters for their private use. Leading helicopter makers are Eurocopter SAS and Bell Helicopter Textron. “Earlier, the US was our largest corporate jet market. Now our focus has shifted to India, China and Russia. In terms of growth, India is the leader in business jets," said Murray Sutherland, regional marketing executive with Bombardier. “We are also planning to offer broad range of services in India." Bombardier has named Mumbai-based Air Works India Engineering Pvt. Ltd as the first Bombardier line maintenance facility on the Indian subcontinent for servicing Challenger and Global type of business ­aircraft. Line maintenance facility offers majority of the repairs and maintenance of business jets, which otherwise would have taken them from Singapore or Dubai. “I cannot quantify the benefits. India has an advantage of lower labour cost, though slew of taxes nullify this positive factor. Certainly, this will end up huge savings for business houses to service their jets," said Air Works director Ravi Menon. Air Works facility, which began accepting Bombardier aircraft in mid-September, has approximately 33,000 sq. ft of hangar space to maintain and repair Bombardier’s business planes. It has plans to set up this facility across main airports of the country. Air Works is the approved service firm for Bell helicopters. “We are planning to service aircraft types made by Gulfstream and Dassault in the coming months," Menon added. Former BPL Mobile chief and Rajya Sabha member, Rajeev Chandrasekhar’s Jupiter Aviation & Logistics Ltd and Max AeroSpace & Aviation Ltd of Mumbai are also looking for similar opportunities. In April, travel business firm and promoter of low fare carrier IndiGo, InterGlobe General Aviation Pvt. Ltd, entered into a long-term sales and service agreement with US’ Hawker Beechcraft Corp. The company sells and repairs Hawker products in India and its neighbouring countries. Of the approximately 122 business, turbine-powered aircraft in India today, 73 are of Hawker Beechcraft. InterGlobe also plans to set up a maintenance, repair and overhaul (MRO) unit for private jets in India by 2010. “As our first step, we will be setting up authorized service centre at the New Delhi airport by early 2008," Nigel A. Harwood, CEO of InterGlobe had said last month. “By 2009, this centre would also cater to the service requirements of other types of smaller jets such as Gulfstream and Cessna, which are not from the stable of Hawker. This would cover West Asia, besides India." Reliance Industries Ltd, Reliance-ADA Group and Tata group are some of the conglomerates that use private jets. Other companies buying such planes for business and private use include Sun TV Network Ltd, Taj Air, Emaar MGF Land Pvt. Ltd, Bharat Forge Ltd, Raymonds Ltd, VRL Logistics Ltd, Hindustan Constructions Ltd, DS Constructions Ltd and Punj Lloyd Ltd.